Rally obedience training | Werriwa All Breeds Dog Training Club (WABDTC) Inc.
Rally obedience (also known as Rally-O) is a fun and terrific dog obedience sport. It’s a less-formal style of obedience that is great for any and every dog and handler. It encourages self-confidence in both dog and handler. Rally-O is often described as a combination of agility and obedience. The rally courses consist of a set of stations numbered sequentially. The team of dog and handler navigate the course going from station to station, and perform the exercises indicated by the sign on each station. 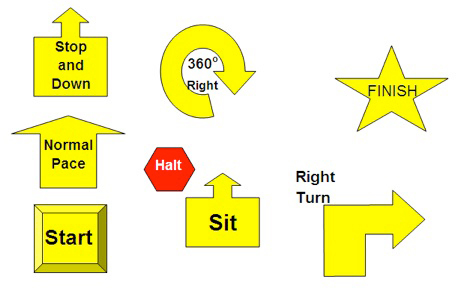 Signs instruct the teams to go fast or slow, to halt (dog must sit at heel), to make turns and circles, to reverse direction, to do a sit-stay-recall or other basic obedience exercises. The emphasis is on fun while building a great working relationship between dog and handler that will serve as a foundation for other human-dog team sports. 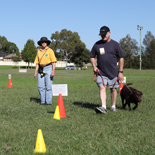 The Rules for the conduct of Rally Obedience Trials may be found on the Australian National Kennel Council website www.ankc.org.au.